Of the Babe and the Maid. And 3 kings from afar. To create all the symbols. Is now over their sneezes? Mark, Barb, Paul, and Vu. For the birth of our savior. And it calls for introspection. Pray for peace, pray for life. That one is our brother. So that we might be like him. And Blessed New Year, too. In the winter of 1996, a great snow fell on the east coast. It started quietly, the flakes so small and crystalline that you couldn’t see them unless you looked up at the streetlights or down toward the slowly whitening pavement. The forecasters expected winds to sweep the storm out to sea after a couple of hours, so most people went about their January business as usual—grocery buying, matinee seeing, 12th night celebrating… returning presents to the store and co-eds to their campuses. At 2:00 p.m., windshield wipers were hardly needed. At 4:00, a bishop leading an Epiphany service in New Jersey encouraged folks to hurry home and not stay for the reception, fearing they would get stranded. By 6:00 p.m. the streets were inches deep in fine powder and traffic had all but disappeared. The predicted winds never blew through, so flakes fell straight and steady for hours. In house after house, friends who had come for dinner tried to move their cars after dessert, but they could no longer tell where the curb ended and the street began. So a great many slid home on snowy sidewalks or camped out in basements and guest rooms for days. We had 8 extra people in our apartment for a week. From Washington to Boston the world took an unexpected holiday. New York City was transformed. There were skiers on 5th Avenue and children up way past their bedtime. Shopkeepers couldn’t open the next morning, so neighbors downstairs traded milk for eggs and matches for toilet paper. Cars were buried or useless, so everyone walked. Planes were grounded until midweek and passengers snoozed under tiny blankets, when they weren’t eating pretzels for breakfast. More than anything else, we noticed the silence. The great buzzing metropolis folded its wings for a moment and rested. We worked puzzle after puzzle, sometimes two in a single day, played board games and card games and snow games in the yard. The only sounds you could hear were voices and church bells, and we listened more and better than we ordinarily did. There was space in our conversations for ideas to develop, or questions to ponder, or challenges to be navigated. My siblings, in town for a family event, found a way to work through some old hurts. The federal government, which had been shut down in the preceding weeks, with insults lobbied in both directions across the aisle, experienced the forced quiet as a gift, too. Maybe there was more we shared than we usually noticed? Maybe the impossible was possible? I’ve been thinking about that time out of time lately, because of the disagreements swirling around our ears this winter, this time not only across the aisle or the breakfast table, but across the country and the world. Maybe we could use a Christmas snowstorm to lock us down for a few days, so that we can discover again that we have more in common than we think… a week of snow football to remind us that winning and losing is fine for games, but not for citizens or leaders or nations… an evening or two quiet enough to let us hear the angels sing in people that we normally discount or discredit or dismiss. God is always being born in unlikely places. What the world most needs is a place to meet, perhaps a snowy field between trenches, where we’ve left our weapons behind… or a table where all are welcomed and fed… or a manger with a baby who will turn our dirty straw into gold… or a conversation that gives everyone space and the benefit of the doubt. However dark the night may sometimes seem, this and every Christmas there is light and space and time enough for the impossible to come true. I was tucking Ben in last night, Rick Riordan’s Throne of Fire on his nightstand and Harry the Big Bear nestled behind his head. But last night, I was more directive. “I’m thinking about war.” And he began to cry. We closed our eyes together. We closed our eyes, and prayed and imagined, together. We held each other, snuggled tight, safe and warm, together. My mind drifted to other women and children in a city far, far away. And then to another woman and child, long, long ago. A child whose birth we will celebrate and remember, with Christians around the world, in just 10 days. Into such a world as this … as ours … our Saviour was born. Advent is about making space, I believe. One year we emptied out a spare bedroom, leaving only a rug and a makeshift altar. We were trying to have a baby without any luck, and we’d gotten tangled up in lots of well-intended advice from friends and family and strategies of our own. Exasperated one morning, Sarah said, “If I’m ever going to get pregnant, I’ve got to make some room for myself and this baby,” so I started moving furniture. It was silly, I guess, a young husband wanting to fix things, to act in response to his wife’s hurting instead of just being present beside her, but the physical labor settled us. It felt sacramental, the sweeping out and sorting through, a tangible prayer of preparation that made the waiting bearable. It’s become a habit of the heart, this Advent clean-up. This year I vacuumed the dust bunnies from underneath the beds and washed all the baseboards and moldings. I’m not sure if it is strictly spiritual, but when I hear John the Baptist say, “Prepare the way of the Lord,” I grab a mop and bucket, lift chairs and roll up rugs. I am making space for something new to be born. An old friend is being treated at Johns Hopkins this Advent, and while he recovers from surgery on the 12th floor, his wife, another dear friend, is staying with us. It’s a gift to be with them during such a tender time, as they navigate procedures and pathology reports, wrapping our family’s busy calendar around their simplified days: waiting, watching, wondering about what’s next. Holding their worry has stretched each of us, making crowded schedules feel more spacious. We’ve found room to hope, and time to listen and laugh and linger over meals. I think we are being prepared for whatever comes next. Life is stirring within us, even in these dark December days. Bless you this Advent. In you is always the space for God to be born. “And so we come to Advent, this sacred season of expectation and anticipation that draws us toward the festival of Christmas. In these days there is much talk of waiting; it is the enduring theme of Advent, and rightly so. For a culture that so often moves too quickly, too unmindfully, Advent’s invitation to wait comes as a reminder of the wisdom of the pause, the standing back, the stopping to think. To ponder. To pray. Yet I sometimes struggle with that word, waiting. So often we associate waiting with passivity and idleness. With boredom and dullness. With a sense of helplessness in the face of time that seems to stretch out interminably. There is this, too: at the same time that waiting can be a corrective to rushing, the flip side is that waiting can sometimes become an excuse for not taking a needed action. The season of Advent challenges us to ponder how it is that we wait. How (and whether) we engage our waiting as a spiritual practice. How we bring our discernment to our waiting, that we may know when to hold back and when it is time to act. I am moved to offer a postscript. Last Sunday, the first Sunday in Advent symbolizes Hope. In a recent conversation, an individual expressed frustration in not feeling God’s love and caring during a challenging situation. For this person, waiting was a struggle. I reminded this person that sometimes if we “Open our eyes to see God’s hand at work in the world about us” (Eucharistic Prayer C) we may indeed experience signs of Hope in the unexpected. This iris currently blooming in the garden right outside my office window is such a wonderful example. 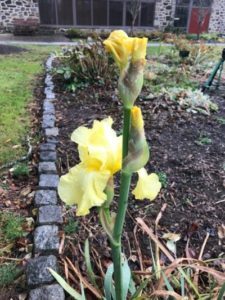 The reality is Iris do/should not bloom the first week of December….but this one is. Right before us. Now. Yes, open our eyes to see your hand at work in the world about us.